Since I got back in the SLR game, I got some additional second hand cameras and lenses. As a result, I'm now the owner of no fewer than five 50 mm lenses. (Well, four 50 mm and one 55 mm.) So I decided to compare them. First an overview, then some testing! 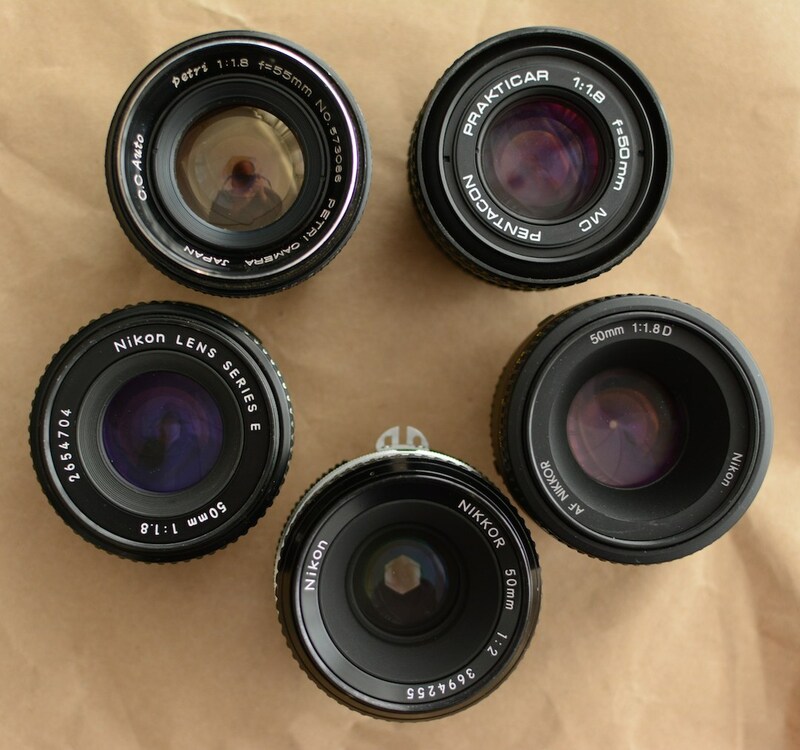 The one on the top left is the 55 mm one that came with my old Petri TTL camera. It's a manual-everything camera with only a light meter needle to show you if your shutter/aperture settings will produce a proper exposure. The last time I used it was the last days of 1999 and the first days of 2000, I think. It still kind of works, but not all that well, and the mercury cells that the light meter needs are no longer sold. The one on the left on the second photo is the NIKKOR 50mm 1:2. It's the only one of the five that doesn't have an f/1.8 maximum aperture, but f/2. This is an AI (auto indexing) lens, a type that Nikon sold in the late 1970s and early 1980s. You can tell from the fact that the smallest aperture number (16) is not in orange, in this case it's in blue. This lens came with a Nikon FE that I bought the other day. The lens in the middle is a Nikon LENS SERIES E 50mm 1:1.8, which came with another FE that I originally bought, but that one didn't work. The lens is fine, though. It's an AIS (improved auto indexing) lens with the orange minimum aperture. It was a low end lens, which probably explains why Nikon didn't bother to include the rabbit ears for compatibility with older cameras, and possibly why it's not deemed worthy of the Nikkor name. A few Nikons from the 1980s and/or 1990s can do shutter priority and program modes with AIS lenses, but both older and newer cameras don't care about the difference between AI and AIS. Unlike its siblings on both sides, the E doesn't have what looks like a built-in lens hood, so it's very small, especially when mounted on my Nikon D7100. Last but not least, there's the AF NIKKOR 50mm 1:1.8D. This is a lens that I bought new for use with my D90 five years ago. It's the only one of the bunch that is an autofocus lens. Even though it's still sold new today it's an old design; current lenses usually lack an aperture ring. But this one still has both the old mechanical AIS couplings as well as the CPU contacts used by modern cameras, so it works with all Nikon F-mount cameras, although it won't autofocus on lower end digital SLRs. With an M42 adapter, I can mount the Petri lens on my D7100, so I tested that one along with the Nikon lenses. I don't have an adapter for Praktica lenses so I couldn't test that one. Click the links to see the test shots with the Petri, the f/2 AI, the Series E, and the AF using manual focus, autofocus in live view and normal autofocus, respectively. The first thing that's obvious is that at f/8, all the lenses are dramatically better. Remember, this is pretty much dead center of the frame, too. The difference will likely be even larger in the corners of the frame. This is a 100% crop, so don't think these lenses are no good wide open, without insane magnification the results still look quite good. Also, using regular AF didn't quite nail the focus. However, the subject was small white text on black in a rather dim room, so don't read too much into that. Interestingly, the Series E lens is the best of the bunch wide open, and perhaps also a hair bitter than the others at f/8. So I guess good things come in small packages.